Stevie Ray was born on October 3rd, 1954, in Oak Cliff, a small suburb of Dallas, Texas. When he was a young child, Stevie's family was constantly relocating due to his father's occupation as an asbestos worker. After a few years, the family settled down once again in Oak Cliff. 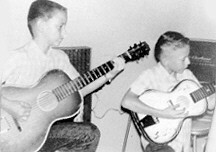 At the age of seven, Stevie received his first guitar, a cheap Roy Rogers acoustic. He had just been introduced to the number one love of his life, music. And it was only the beginning. Stevie had many influences in those early years; Albert King, Albert Collins, T-Bone Walker, Buddy Guy, and Otis Rush were just a few of his favorites. But there was one guitarist in particular that had the biggest influence on Stevie. That was his older brother, Jimmie. Even after Stevie discovered the great British guitar gods of the late 60s, It was still Jimmie who affected Stevie the most. Stevie always compared himself to Jimmie, and it was probably that constant competition and determination to catch up to Jimmie that drove him to become the great that he was. Stevie started playing professionally in his early teens. He would play in bars all night, sometimes until six in the morning, then go to school, often falling asleep in class. It was around this time that he started using drugs to enable himself to keep going. When he was 17, Stevie dropped out of high school to concentrate on music full time. Stevie eventually grew tired and frustrated at the "straight-laced" lifestyle of Dallas and decided that it was time to make a change. Stevie had heard that Austin was a place where people could dress and act the way they wanted and that it was the "hippest" scene around--sort of a Texas version of San Francisco. He decided that if he was going to get anywhere, Austin was where he had to be. After all, Jimmie had already gone there and was having pretty good success. While in Austin, Stevie led the life of a vagabond, crashing on people's floors and couches with little more than his guitar and a portable record player. Stevie played with many rhythm and blues bands during this time, but still nothing was happening. After a while, Stevie formed a band with some other Austin notables, calling it the "Triple Threat Review." After much bad luck and many disappointments, members of the band started to go their separate ways. Stevie felt that he should step out and be a front man. And with the remaining members of the band, Chris Layton on drums and Tommy Shannon on bass, he rechristened the band "Stevie Vaughan and Double Trouble," after the song by Otis Rush. Things were starting to happen. After working hard for some time, Double Trouble started to become quite popular around the Austin area and soon was one of the hottest acts around. With the band's stripped-down sound and Stevie's powerfully emotional vocals and guitar playing, the band never felt the need to stray too far from their musical roots. People who saw them could tell right away that this was the genuine blues article. All of this hubbub around Austin somehow landed the band an invitation from the Rolling Stones (who have always been fans of traditional American blues music) to play a party they were throwing in New York City. The band was very excited at the thought of this opportunity and the possibility of a record deal with the Rolling Stones' record label. They pulled out all the stops for this "gig of a lifetime," but, unfortunately, their hopes were not fulfilled. And so, once again, it was back to Austin. One good thing came from that gig, and that was an invitation to play at the Montreux Jazz Festival. They would be the first unsigned band ever to play this esteemed event. When they did, the upper-class jazz crowd wasn't prepared for their raw, dirty blues sound, and they were booed by a portion of the audience. This shook the band, but they finished their set, and afterward Stevie (who by that time was calling himself Stevie Ray) was approached by David Bowie and also by Jackson Browne. Browne offered the band free studio time; Bowie wanted Stevie to record guitar tracks for his upcoming album, Let's Dance. Stevie took both up on their offers. Things were looking extremely good for Stevie Ray. The band made their way to Los Angeles to Browne's studio, where they cut tracks for what was to become their first album, Texas Flood. They completed the whole project in just two days. Then, Stevie went to New York to record with Bowie. When the album was completed, David asked him if he would like to be part of the touring band, but for one reason or another, things didn't work out, and Stevie returned to Austin to his patiently waiting band. Regardless of the Bowie tour, Stevie Ray Vaughan's star was on the rise. The band signed a deal with Epic Records, and the tapes recorded at Jackson Browne's studio were personally produced by rock and roll legend John Hammond. Suddenly, after his years of hard work and perserverance, the whole world wanted to know about Stevie. The year was 1983. This newfound success led Stevie and Double Trouble down a long and winding road filled with many triumphs. 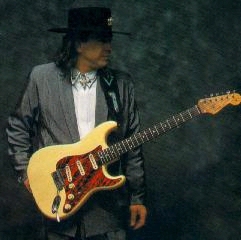 Texas Flood was received to much critical and popular acclaim. In a time where rock music was filled with overly processed, heavy metal guitar sounds, Stevie brought to the mainstream a warm, soulful, tube-toned blues style that refused to be ignored. In 1984, the band recorded and released Couldn't Stand the Weather, again to much praise. By now, Double Trouble was touring the world, playing for the many new fans they gained with each successive album release. However, along with all of their new fame came an ever-increasing work schedule. The band worked nonstop. Concerts, television appearances, invites for guest spots on other people's records, interviews -- the offers kept pouring in. Stevie's drug and alcohol use increased dramaticaly. He felt he needed it to give himself the strength and stamina to keep up. What he didn't realize was that it was rapidly wearing him down. The band started work on their next album, Soul to Soul, in 1985. This time, along with the usual three-piece, Stevie recruited keyboard player Reese Wynans to play on the record. This new addition fleshed out the sound of Double Trouble and gave Stevie more room to breathe musically, as he didn't have to worry so much about holding down the rhythm. After the album's release, Reese continued on with the band when it was time to go back on the road. Recordings made while on tour eventually became the next album, Live Alive, which was released later in 1986. Stevie's drug and alcohol use kept on increasing, and while the band was touring Gemany, he collapsed on the street and had to be hospitalized. Stevie knew that this was his moment of truth and that he could no longer go on without help. He decided to check himself into rehab in order to save his own life. Stevie's rehabilitation was a success! He had managed to turn his life around. Now just one question remained: could he still be creative without the vices of his past? Stevie wanted to share with the world his newfound freedom. He wanted to help others who were suffering as he had. He decided that his next record should be the story of his own battles with addiction and how he was able to overcome with the help of others. In Step, released in 1989, was said to be Stevie Ray's best album yet. The band once more toured the world, with Stevie spreading the word of the new lease he had taken on life. Many fans shared with Stevie the struggles of their own problems, and he wanted to help them all. His life and career were the best they had ever been. In 1990, two shows were scheduled for August 25th and 26th at Alpine Valley in East Troy, Wisconsin. At this mega-event, Double Trouble shared the bill with Eric Clapton and Robert Cray. It was a blues extravaganza that featured several special guests, including Jeff Healey on the first night and Buddy Guy and Jimmie Vaughan on the second. At the end of the second night's performance, there was an "all-star" encore that featured all five guitarists sharing the same stage. Stevie couldn't have been happier. After the show was over and many promotional photos had been taken, everyone boarded the vans and helicopters that were waiting to take them all back to Chicago, a short distance away. Sometime after midnight on August 27th, the helicopter carrying Stevie and Eric Clapton's bodyguard and tour manager crashed into a fog-shrouded ski slope just outside the concert venue, killing all on board. Stevie Ray was just thirty-five years old. Stevie Ray Vaughan was gone, but most certainly was not forgotten. Nor will he ever be. He did much for the blues legends that inspired him, never failing to acknowledge them. He opened the eyes and ears of many people, young and old, to the emotion, feeling, and intensity of blues music. Due largely to Stevie Ray's influence, the blues is once again part of the modern mainstream. The music and spirit that he left us with will live on in the hearts and souls of the many thousands of fans he made over the years. I have to tell you, Stevie Ray Vaughan had a huge impact on me as a guitarist and musician as well as on the way I listen to music. I have learned more about guitar playing from him than I have from anybody before or since. He taught me that the most important thing is to have soul in every note you play, to try to transport the listeners to another place so that they may experience the joy, sadness, desperation, or any other emotion right along with you. One of the greatest thrills of my life was being at the first night's show that weekend at Alpine Valley. Unfortunately, it was the only chance I had to see Stevie Ray. I was deeply saddened when he died and grieved for quite some time. But when I listen to any one of his albums, I realize just how much magic he made.